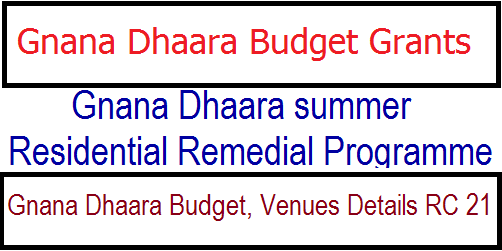 RC 21 Gnana Dhaara Budget Grants Unit Cost Venues Details Dt:22.05.2018. Gnana Dhaara 801 venues are identified/mapped across the state as on 21.05.18. Sub: School Education — Remediation Programme — Gnana Dhaara summer Residential Remedial Programme from 28.05.2018 to 09.06.2018 - Release of budget to the District Educational Officers to meet the printing expenditure, logistics and others during the programme — Orders issued. 1. Annexure I — Specifications and unit costs for Printing of material at District level Annexure II - Specifications and unit costs for Logistics to Gnana Dhaara venues Annexure II — Consolidated budget statement. All the District Educational Officers in the state are aware that the GNANA DHAARA Summer Residential Programme for identified students who are coming to classes VI and X students in the academic year 2018-19 is rescheduled from 28.05.2018 to 09.06.2018. 2. If there is any increase in the number of venues, the budgets will be released on claim subject to she submission of proper bills as per the unit costs prescribed. In case of decrease of centres, the amount sanctioned per centre should be refunded to SCERT along with the UCs. Appropriate budgets shall be released to the Heads of the Programme venues/Programme Coordinators as per the specifications detailed in annexure — 1. Hence you are requested to utilize the budget as per the specifications given. In case of any short fall of budget in any category, you may meet the amount from the overall budget released to a centre. You are further requested to submit Utilization Certificate, bills and vouchers of the allocated funds and return unspent balance if any, within 10 days of the completion of the programme. District wise total amount in Rs.